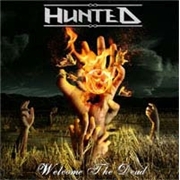 Cardiff band HUNTED have been hard at work touring the UK, and marketing themselves. Not least with their 2009 demo “Alone”, which has been instrumental in hailing them, as one net site put it, “…the next DREAM THEATER”. They´ve played Bloodstock, featured on the official ProgPower USA promo CD and now this full-length, which had an original limited release in 2010. Their influences range from DREAM THEATER via IRON MAIDEN to OPETH. So…impress me!